Here it is! Kaia’s Flower Fairy/Pearly Mermaid/ Blingy Princess skirt! It is a holiday gift for her and I can’t wait to give it to her! Ok, so there is a little math to do with this pattern, but it’s really not that hard! Trust me! Knit a gauge swatch from the yarn and needles that you have chosen. Count the stitches and rows in 4 inches and divide by four. On your first row of the main body, after the 2nd, 4th, 6th, and 8th stitch markers, P3 instead of knitting, then begin knitting again. In each successive row, continue your knitting until you come to the last purl stitch in the previous row, then P3, and knit on. This creates the spiral pattern. As you are working this pattern, if you come to a place where you are needing to make an increase in the middle of the purl pattern, just increase after your P3. Row 1 – Knit one row, placing markers every ___(H) stitches. Repeat rows 2 and 3 until _____(C) inches from cast on. Repeat this pattern until _____ (B) inches from cast on. From this point, you will be working in between the stitch markers. Count the number of stitches you have in between the markers. Divide this number by two. If you end up with an odd number, round down. For example, if you have 30 stitches and divide by two you get 15. round down to 14. This is the number of beads you will thread on to the yarn before joining it back to the work. You may need to use a sewing needle to do this. Once you have threaded on your beads, begin working in between one set of stitch markers. Leave the other stitches on the circular needle as you work back and forth in between the stitch markers, one set at a time. Right side – K2tog, place bead, K to last 3 stitches, place bead, SSK. Wrong side – P2tog, P to last 2 stitches, P2tog. Repeat this pattern until you have 1 stitch remaining. All your beads should have been placed by now. Tie off your yarn and cut, leaving 10 inches. Thread on more beads, if desired, to make beaded ‘dangles’ at the end of each point. Tie off yarn and thread in loose ends. Repeat this in between each set of stitch markers. Tie off and weave in any loose ends. In a contrasting color and double pointed needles the same size as your main needles, cast on 3 stitches leaving a 10″ tail. Knit an I-cord 20″ longer than your waist measurement _____(A + 20″). Cut and tie off ends. 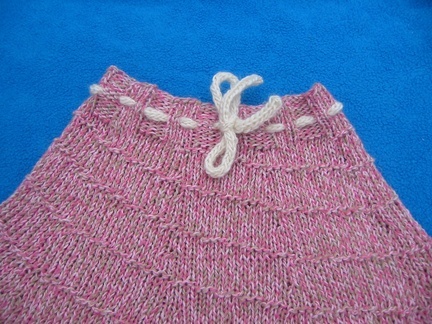 Using a tapestry needle, thread the cord through the waist band. Thread in all loose ends. Phew!! Now, sit back and admire your lovely skirt!! Please feel free to email me if you have any questions, find a better way to do any of this, or anything. And if you just love the pattern so much that you want to send me money, gifts, chocolate…. well, I guess I’m ok with that!! Send pictures of your skirts!! I’m sure you can’t wait to give it to her! I like the loose gauge, it looks comfortable. That is amazing! i love it. i just need a little girl to make it for, lol! You did a very good work in calculation. And I love this skirt pattern!! I’m going to knit one of these for each of my girls. My 4 year old will be just about the size you knit it in, so I’m going to get 5 hanks for her, but I’m not sure how to figure out how much yarn for my 9 year old. Can you tell me how to figure that out? Sorry, I’m kind of new to this! I’m sorry it’s taken so long to answer your question. With a 1 year old running around the house I’m having a hard time sitting down to figure out the calculations, and still haven’t had the chance. And, truthfully, I’m not really sure how to calculate exactly how much yarn you would need. With the increase in the stitches as you go for the flair of the skirt, I would need to dig up some serious geometry to figure it out (Does anyone out there know??) If it were me, I would probably end up getting 7 or 8 skeins and just having extra left over. Sorry I’m not much help! I will keep trying to figure it out and let you know if I do! Hi! I am making this skirt for my 8 year old and am to the part of adding the beads. I have never done this before and they keep sinking to the back side of the work. What am I doing wrong as I place them? Thanks so much!! I had that problem sometimes too. 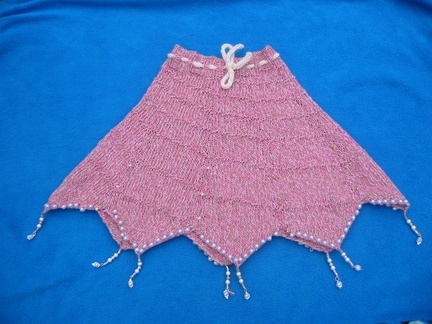 It’s hard to describe, but the bead just needs to be moved to where the yarn comes to the front of the skirt. It’s easy to do when you have just knit (or purled) that stitch, but harder once lots more stitches are in place, because things get tighter. 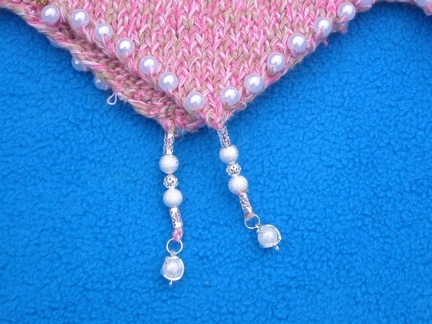 As you stitch each bead into place, notice where it is on the stitch…. will it end up in front or in back when the stitch is done? Does that make any sense:-)? Ask me again if it doesn’t. Will you send pictures when you are done? Well, I hope your daughter likes it! I love how you added the beads!!! Thanks so much for sharing the pictures! I just finished the main body of the skirt and am stuck on the directions “Cut and tie off yarn” does this mean I bind off or just cut if from the skein? Yes, you actually cut the yarn and knot it. You are done with it at that point. You will need to figure out your calculations for adding the points and the beads and then you pick up from there. Does that make sense?? This is so cute. I have recently taken knitting up again after 15 yrs. I have a giant 2 yr old that is in 4T and not sure how to rework this to make it. I have been having a hard time trying to find patterns for toddlers and this is my last hope for now. So here I go! Yes, you would cast on to knit a swatch of about 4 x 4 inches. What you are looking for is your number is stitches in an inch as well as your rows in an inch. The reason why I suggest a 4×4 swatch is if you knit a swatch too much smaller you end up having to stretch it out a bit to count the stitches and rows in an inch. You don’t need a full four inches square, but you need a big enough swatch to count your inch with the yarn laying flat. Does that make sense? Will you send a picture when you are done?? I finished the skirt today and Madeline loves it! She wore it when she walked over with me to vote this afternoon and received several compliments already. Unfortunately, I took one photo and then the battery died, so when the camera is recharged I will send a picture. I’m just about to start my second one! My daughter has loved her fairy skirt so much, I’m making a bigger one. I think I might put little bells on the points this time. The Flower Fairy Skirt is fantastic. My 6yr old grandgirl will love it! Thank you so much for sharing this great pattern with us.